Note: I am in no way compensated for this review. I am not affiliated with "Accelerated Learning Methods" in any way. I simply love this product and I wanted to write about it. Memory Magic is a computer CD from www.acceleratedlearningmethods.com, designed to help young children develop photographical memory and speed reading. There are progress charts and reward certificates that you can print out and use with the program. This is my son's favorite part of the program. Based on Makoto Shichida's program for developing photographic memory, the game helps children to easily memorize 100 objects in sequential order. When I first heard about this, it seemed incredible to me, but because of the silly nature of the story, simple animation in the computer game, and the funny voice that tells it, I was personally able to memorize them within a couple of days, and my 3-year-old followed suit within a week, with some story prompting. 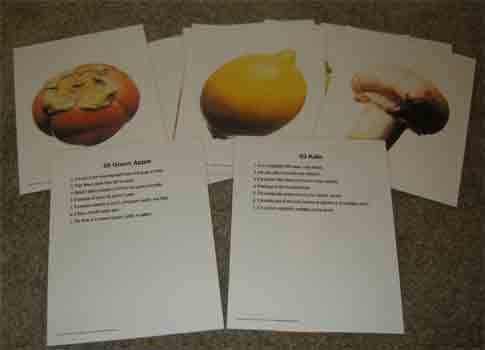 The game also includes a printable file, which is pictured here, and used in the video. This video was made a week after we got the program in the mail, and features the first 20 cards. It was the first time we "played the silly story game" that day. If we want to do all 100 at the same time, we do it on the computer. 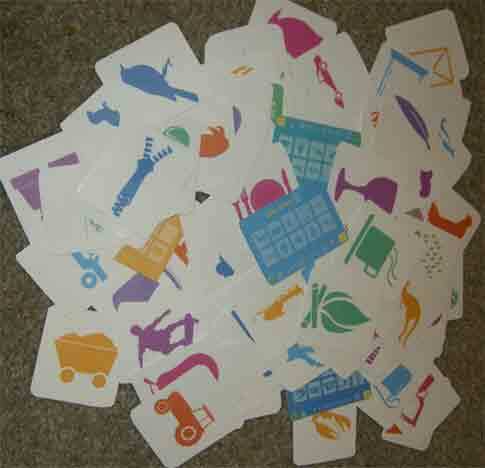 These are associated with the bit cards. They quickly show 10 related bits, with the picture first and then the text. Then you can go to a screen with 20 or so small pictures and click on the ones that were previously flashed. If you get it right, the image is replaced by a star, if you get it wrong, it turns into a splotch of paint and disappears. When you have selected the ten that were shown, a smiley face comes out and says "Good job", regardless of how many you may have gotten wrong. This game is challenging for me! I usually play it with Peter and we try to remember the pictures together. Alternatively, you can just let the computer flash through any of the 380 pictures and let the kids watch it like a video. This is what I do with my younger children. These are neat. I wouldn't pay six dollars for them, but my children like them and I think that they are a valuable asset to our bits program. We show them during breakfast every day, and it takes about 20 seconds to do. My five-month-old baby can do these. My husband has been studying eye health for himself, and he was very impressed. This is a computer game that flashes a dot in a specified shape. On the next screen you click on the outline of what you saw. Harder levels flash more than one shape before you get to click on what you saw. This is a challenge for me! With my children, we only watch the flashing, which they love. Picking the outlined picture is frustrating for them, so we do not do it. The programming. This is an older program, and it was not very user friendly to set up. My husband thinks that the makers were originally developing a subscription website, and when that didn't work for whatever reason, they put the whole website onto a disk. You essentially are getting a webpage in disc format. Included are pdf images of buttons used in the game, and other weird files that my husband could decode but are Greek to me. The "name" of the disc comes up as "Drag contents to" Instead of "Memory Magic". I also had to install a flash player off the internet to play the games. In the "Learn More" section, the information links to their website, so you have to have internet access to learn more, AND some of the links are broken. But don't let that stop you. The content is fantastic. If you are potentially interested in purchasing this product, I recommend subscribing to their website. We purchased this product when a secret sale came up that I only knew about because of my subscription. After seeing the quality of this product, I will probably be purchasing from them again, and I enjoy their e-mails. They have a lot of useful information, whether you purchase from them or not. I have been subscribed for a year and I look forward to their e-mails. My name is Brad Davis, Owner of Mercury Learning Systems LLC and creator of Memory Magic Accelerated Learning Games for Children. Thank you for your wonderful testimony and feedback on our games - what you liked and didn't like. We just wanted you to know we just finished and complete upgrade of all these games. They will now auto-play without the need of a web browser. There are also many enhancements that will make our games even more fun to play. Please visit out site soon and check for our new upgrade release or Memory Magic Games and check out our other outstanding and unique accelerated learning products just for your children! Thank you looking at my review! It's great to know the pros and cons going in to a product. Now, what's not to like? We love your products! I am looking forward to sitting down and watching these videos. I have put myself on a timeout for abusing the net again so I have been limiting my useage :( Thanks for these great posts. I did get your email about these going on sale. Thanks for the tip. I hope when I get them, I will get lucky with another great sale! Oops! I am sure you figured this, but the post is from me, Ashly. Not my hubby. I am not signed in! I did assume! It turns out that the sale I sent you is their older version, they are cleaning out their inventory. It's even cheaper now than when I bought it. The newer version has 780 bits, and none of the "cons" listed in this post. I'm a little bit sad that I didn't realize that it was the older version that I was purchasing, but if had had full disclosure, I probably would have purchased the way I did anyway. Besides the bits and the new programming, it looks like the same program to me. Thank you. I appreciate your review I searched high and low for some type of video to show the program/ game and found nothing. I wish they had trials or something like that so you get a better idea of what you are buying. But I really enjoy yur review I will follow your page!